Bat trapped in mist net as part of monitoring survey performed by the Bat Grid Inventory and Monitoring Group. It’s October–the time of bats and brooms and mice and …moose? 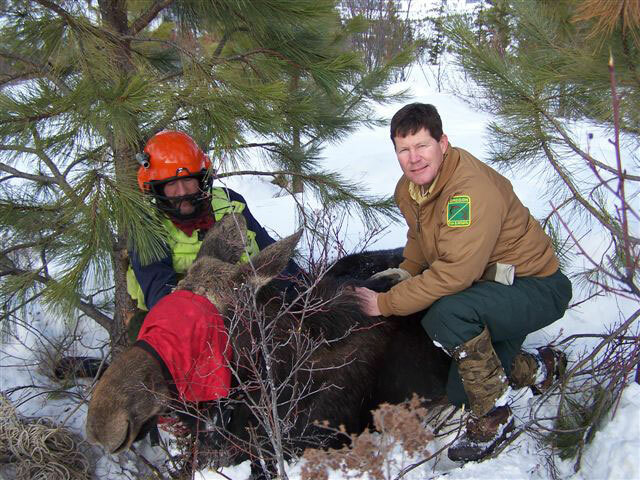 ODFW wildlife biologist Pat Matthews with a member of the team that helped collar a moose in northeast Oregon. The first moose to come to Oregon wandered south from Washington or west from Idaho across the Palouse Prairie. They stayed to establish a herd in the Blue Mountains north of Elgin, and today there are an estimated 50 adults and calves in the area. “Over the years, there have been sightings of individual animals, but it was only in about 2005 that we knew we had a resident herd,” said Pat Matthews, ODFW wildlife biologist, Wallowa County. How many there are, is another question. 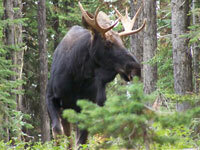 Although moose have a distinctive appearance, keeping track of them isn’t all that easy. Generally solitary animals, they live in fairly remote areas. At first, counting the animals consisted of recording sightings by forest service workers and the occasional hunter. But, with the knowledge of a resident herd, ODFW biologists began formal aerial and ground survey work to try and get a better handle on the actual number of animals. A couple of years later, a project was initiated that included radio collaring a few adult animals to gather data important to species and habitat management—population status, calf survival, mortality, habitat use and seasonal movements. Moose are the largest ungulate in North America and yet have the ability to move quietly and gracefully through the thickest stand of timber. As a biologist, Matthews has long been drawn to the mystique of the moose, its size and appearance and its association with true backcountry wilderness. Does he think moose have a future in Oregon? As far habitat goes, it is believed that moose in Oregon will be largely dependent on riparian corridors and deciduous growth that occurs following active timber harvest, control burns, or natural fires, along with dense stands of mature conifer timber. A number of organizations are involved in the moose project, hoping to gather information that will help secure their habitat so moose enjoy a long healthy residence in the state. Partners include the Umatilla National Forest, Oregon Wildlife Heritage Foundation, Confederated Tribes of the Umatilla Indian Reservation, Blue Mountain Habitat Restoration Council and the Josephine, Yamhill, Capitol, Lincoln, Pioneer, Columbia, Rogue, Baker and Union Chapters of Oregon Hunters Association. Oregon’s moose are Shira’s moose which are also found in Wyoming, Montana, Idaho, southern British Columbia and in some areas of Utah, Colorado and Washington. 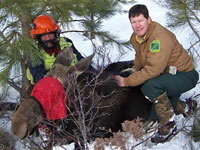 If you see a moose, contact your local ODFW office. For more information on the Blue Mountain ecoregion, visit ODFW’s website. Contact Pat. Bats of the Pacific Northwest. Bats are everywhere this month—on holiday decorations, costumes and cupcakes. But while the flying mammals’ creepy image is as healthy as ever, real bats aren’t doing so well; disease, habitat loss and human development are all threatening their survival. To find out what you can do to help, take action by Friday, Oct. 30 and register for the bat conservation workshop that will be held at the Oregon Zoo on Nov. 3. Intended for professionals whose work affects bats (either directly or indirectly), including land and park managers, wildlife management officials, conservation groups, land-use consultants and contractors, health officials, researchers and educators, the workshop will focus on bat ecology, conservation issues in Oregon and practical recommendations for bat management. Cost to attend the workshop is $30, which includes lunch and snacks. To register and see a detailed workshop schedule, visit the zoo website. The workshop is presented by the Oregon Zoo, ODFW, the U.S. Forest Service and the Bureau of Land Management. White-nose syndrome is killing bats in the eastern United States at an alarming rate. While it hasn’t arrived in Oregon, it is quickly spreading across the eastern U.S., and Oregon’s scientists are concerned. 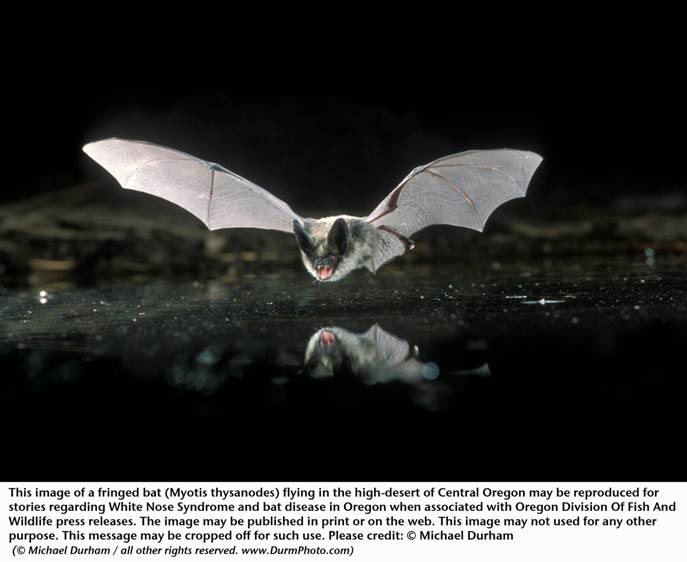 Most Oregon bats hibernate in secluded, cold locations that allow them to lower their metabolism and conserve energy to get through the winter. 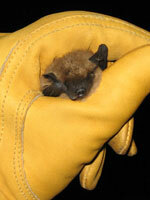 The primary cause of WNS is a cold-environment fungus that thrives in the same temperature range as hibernating bats. Once infected, bats may demonstrate a white fuzzy growth on their nose, from which the disease is named. It’s thought that the fungus interrupts hibernation patterns and causes bats to increase their normal number of winter arousals from torpor forcing them to burn calories they can’t afford to use, depleting their fat reserves and causing them to starve. There are a few things Oregonians can do to help. First, never disturb a bat colony. Bats are highly sensitive to disturbance when they gather in winter to hibernate and in summer to give birth. Bat colonies are found in buildings, under bridges, in attics and in mines and caves, which should be avoided. If you do enter a cave, decontaminate your clothing and equipment before entering another cave to avoid transferring any potential disease. Finally, notify your local ODFW office if you observe several dead bats in the same location. It is not necessary to report single bat deaths. If you have been in a cave, follow the U.S. Fish and Wildlife Service’s recommended decontamination procedure which is detailed on the Northeast Region website. There are 15 species of bats in Oregon. Many of them are identified in the Oregon Conservation Strategy as species in need of help. Learn more about them in the Conservation Summaries of Strategy Species section of the Strategy. For more information and a flyer on white-nose syndrome, visit the Western Bat Working Group website. Fringed bat. Photo, Michael Durham. Learn about Oregon’s bats so next time you hear one of those batty myths, you can share your knowledge. See the Living with Wildlife: Bats flyer for more information (pdf). Contact Karen Buell at ODFW.